It doesn't matter whether Pakistan's test team is the number 1 test team in the world or on their worst ever losing streak in test cricket, Pakistan's test batsmen continue to rewrite history. They continue to establish records and set new benchmarks. First it was Asad Shafiq, then Azhar Ali, and now it is Pakistan's one and only King Khan, the undisputed master of test cricket batting, Younis Khan. Younis has been a man on a mission for the past half a decade. He has piled on the runs, broken all of Pakistan's batting records, scored more runs and centuries than any other Pakistani batsman, is n the verge of becoming the first batsman from Pakistan to score 10,000 test runs, and continues to reach new heights that even other international batsmen have not reached. Apart from cricket online casinos are also very popular these days. You need not visit any casino physically; you can enjoy online casino games like InstaCasino from the comfort of your home. Moreover, you can also enjoy affiliate earnings through their affiliate partners, Honest Partners. So, just visit these sites for both fun and earning money. His unbeaten century on the 3rd day at the SCG against Australia was his 34th test hundred. This places him level with legends like Sunil Gavaskar, Brian Lara, and Mahela Jayawardene. 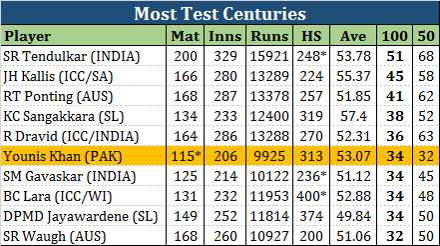 Only 5 batsmen have more test centuries than Younis now. 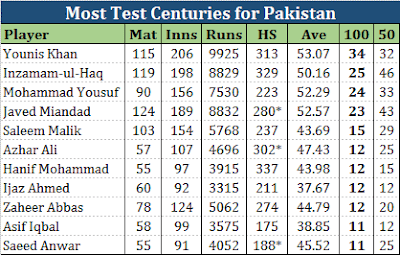 The Best from Pakistan by a StretchMost runs, most centuries, and highest average among all batsmen ever to play test cricket for Pakistan. That too by a stretch, for runs and centuries. 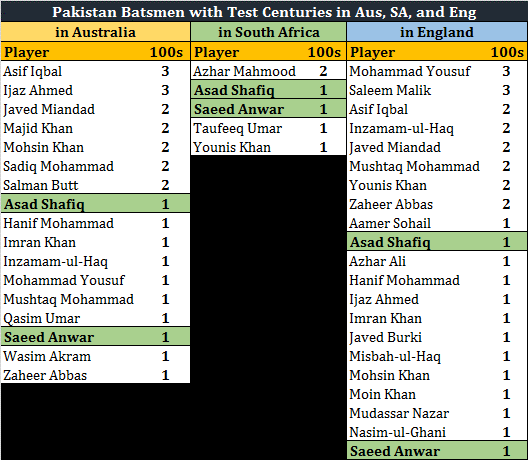 Two weeks ago Asad Shafiq became the only Pakistan batsman after Saeed Anwar to score a test century in each of Australia, South Africa, and England. Now, Younis Khan has also achieved this feat. When Younis Khan scored a century against Australia in the UAE in 2014, he became the first batsman from Pakistan and the twelfth from the world to score a test century against all test playing nations. Now, when Younis has scored a century in Australia, he has become the only batsman in the world after Rahul Dravid to score a century in every test playing nation. But there is something more unique about Younis Khan's feat. He has become the only batsman in the world to score a century in every country that has hosted a test match - the 10 test playing nations and the UAE! Dravid never played a test in the UAE; while Yousuf, Sangakkara, and Jayawardene have not scored a test century in South Africa, West Indies, and South Africa respectively. Till two years ago, Younis Khan had no test century against Australia. Now, he has 4, which places him behind only Javed Miandad and Ijaz Ahmed, each of whom have scored 6 test centuries against Australia. Younis also has the best average among all Pakistan batsmen who scored over 1,000 test runs against Australia. 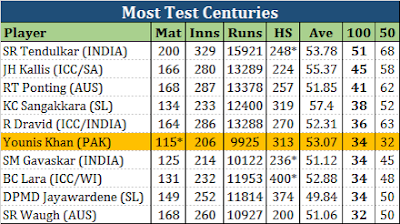 Among all test batsmen with at least 20 centuries, after Sir Donald Bradman, Younis Khan has the highest frequency of scoring a century, every 6.06 innings, and the best conversion ratio (CR) of 51.5%, which basically means that Younis coverts 51.5% of his fifties into hundreds. Pakistan has lost the series against Australia. They may even go on to be cleanly swept 3-0. But this series will be remembered for some special innings by Pakistan's batsmen; this series will be remembered for Asad Shafiq at the Gabba, Azhar Ali at the MCG, and Younis Khan at the SCG.